Remove from the refrigerator and mix again. Using hands, press the mixture together so that the ingredients will bind well. Preheat oven with fan at 205°C. Place aluminium foil over baking tray and lightly oil the surface of the aluminium foil. Roll meatball mixture into balls of 3-4cm in diameter and place onto the well-oiled aluminium foil. Bake for 20-25 mins until browned. While baking the meatballs, heat up sesame oil in a pot and add in minced ginger and chillies. Stir fry until fragrant. Then add chicken stock, water, soy sauce, fish sauce and lime juice. Allow to boil over medium heat. Give the soup a taste and further add fish sauce and lime juice by 1 tsp intervals according to your liking. Turn the heat to low and slowly stir in eggs to create ribbons. Put in carrots, spring onions and coriander. Give a quick stir and remove from heat. Ladle egg drop soup into serving bowls. 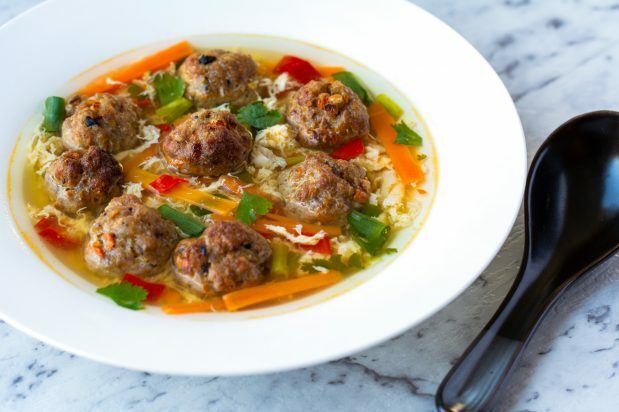 Gently drop the meatballs into the soup and serve.